Fresh to Market Finds - Price Points for Every Budget! Goldeneye by Jim Schmiedlin, very early, 1976. From the private collection of Joe Smith to be auctioned Saturday night. "Minis" by Nelson and Phylis Thomas. 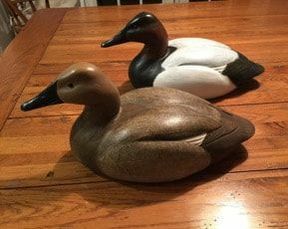 Canvasbacks by Wayne Boblenz, 1972. 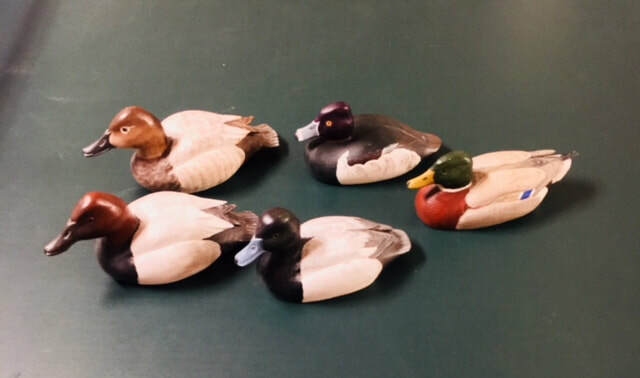 Check in Friday 7 p.m. - Starts at 7:30 p.m.
Again this year, entry fees and attendance fees will be waived as the ODCCA demonstrates their appreciation to both collectors and carvers, promoting the camaraderie for a common interest, The Decoy! Entries from the very popular Cocktail Bird Contest are auctioned Saturday night. Collectors love this part of the auction because the entries are highly detailed and beautiful! And they take up very little shelf space. The contest requires that the cocktail bird must fit in a cocktail-sized glass. 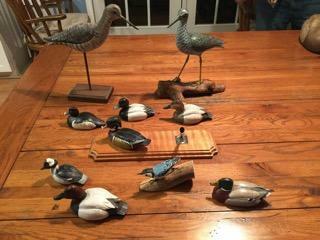 All of the entries become property of the ODCCA and will be auctioned Saturday evening. 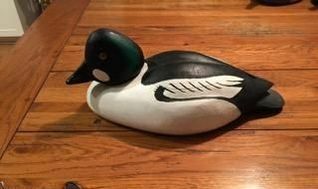 The auction proceeds are split with 50% to the carver and 50% to benefit ODCCA.